Bosch has over 100 years experience building water heating systems, including 25 years with condensing technology. So, you can trust Bosch has the best water heating system for a variety of residential and commercial applications. From high-efficiency gas condensing tankless water heaters to solar thermal systems and geothermal heat pumps, rest assured they build something to handle every need. And best of all, you can buy with confidence knowing Bosch systems are designed to fit together and work together, which means you can integrate Bosch products to build a customized solution very easily. TJ’s is very proud to have been selected to become an Accredited Bosch Contractor of Bosch heat pumps, Bosch on-demand hot water heaters and Buderus boilers. When you choose an Accredited Bosch Contractor, you know that you are getting the best in the industry. TJ’s has the credentials, the knowledge, and the expertise to design, install and service your boiler or geothermal system. When you combine that with high quality Bosch products, you have the best system money can buy. And, only your Accredited Bosch Contractor can offer you an additional one-year extended warranty on your Bosch qualified products. 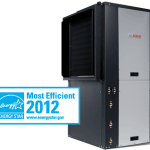 Awarded as “2011 Most Efficient” unit by Energy Star, the TA offers the ultimate in performance! Lowering your monthly utility bills has never been easier with Bosch’s Energy Star rated TA Series. This luxurious two-stage unit features a black cabinet with silver brushed aluminum front and is available in Vertical, Horizontal, Counterflow and Split system configurations from 2 to 6 tons. Its energy efficiency makes this unit the best-in-class in operating cost savings. Requiring less energy compared to other manufacturers, these two-stage units achieve the same output to cool or heat your home, helping you reduce your energy costs. To provide the best in quiet comfort, the TA Series is equipped with an exclusive sound package. 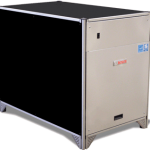 The compressor is surrounded by a multi-density sound blanket and the units come standard with a floating base pan, which separates the vibrating compressor from the exterior cabinet. The compressor is mounted on a heavy-gauge steel base pan that floats on a unique high density, visco-elastic material, reducing sound and vibration to an absolute minimum. The new Bosch TW122 10 ton, high efficiency water to water product meets current Energy Star tier 3 efficiency standards. This product employs dual compressors and refrigeration circuits which translate into industry leading efficiency and unmatched flexibility. Additionally, the unit has been designed from the ground up for low noise levels with multi-density compressor blankets, heavy gauge steel paneling and an innovative rigid aluminum space frame that employs exclusive Bosch technology. This new 10 ton unit offers all of the features and comfort of a high end residential appliance, coupled with the ruggedness and durability of a premier industrial unit. Please visit our dedicated Buderus page for featured gas and oil boilers.